There's no need to let corrosion problems wear down assets, reduce efficiencies or cause expensive equipment failures. Dow has solutions for keeping corrosion at bay and protecting your bottom line. Is corrosion a problem in your cooling water operation? We can help. Dow's expertise in filtration, chemical and monitoring solutions for controlling biological contamination can help you protect equipment, prevent corrosion and keep your operations flowing efficiently. Are you dealing with biological contamination? We can help. Dow offers a robust portfolio of products for treating turbid waters and biofilms, from filtration to biocides and polyacrylates. And we can work with your service provider to combine technologies to optimize operational efficiencies. Is particulate fouling costing you time and money? We can help. With extensive capabilities in water filtration, scale inhibitors and biofilms, Dow works with your service provider to design individualized solutions for preventing scale and improving heat exchange efficiencies. Is scaling an issue in your facility? We can help. The high costs, downtime and process upsets that go along with resistive fouling can take a toll on your operation. But with Dow's full range of industry-leading technologies, you can clean that problem up. Is tough fouling a problem at your plant? We can help. With an extensive range of filtration and purification technologies, most of your blowdown water could be recovered and reused as makeup water. Is water scarcity a problem for you? We can help. From energy companies to oil refineries to industrial manufacturers, Dow’s expertise in cooling water treatment is making a difference for companies around the globe. Together with your service provider, we can help you save money, prevent problems, and manage your water resources. Looking for comprehensive water cooling system knowledge and experience? Dow does that. Do you want global knowledge paired with local expertise in addressing water management issues? Dow does that. 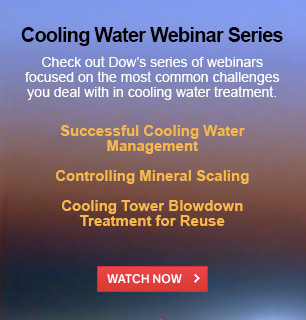 *At Dow, we want to be a resource for you in learning about solutions to cooling water challenges. Be sure to continue working with your service providers, distributors and OEMs to purchase our products and benefit from their expertise. Dow solutions are helping customers with a broad range of needs to address their cooling water challenges. See what they have to say. Dow’s experts have extensive experience working with customers worldwide to optimize their cooling water operations. Learn from them. Dow’s expert centers offer locally focused problem-solving and solutions in locations worldwide. From optimizing water management to improving refinery operations to reducing carbon footprints and more, Dow brings formidable expertise across a broad spectrum of science and engineering disciplines to create solutions that help move customers forward, profitably and sustainably. Dow’s exceptional portfolio of products and deep expertise in water separation technologies improve businesses and lives worldwide. As a leading provider of biocide and antimicrobial technologies, Dow plays a key role in helping protect enterprises from the effects of harmful microorganisms. 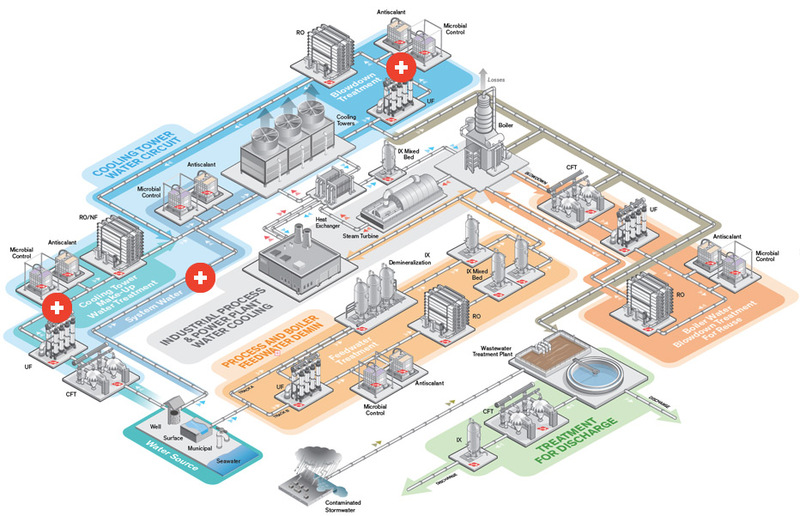 From exploration and production to refinery operations, Dow’s industry-leading products and expertise help energy companies turn challenges into opportunities. About Dow Water & Process Solutions Contact Copyright © The Dow Chemical Company (1995-2015). All Rights Reserved. Please fill in the fields below and press the "submit" button when you're finished. Environmental conditions, regulations, business needs—no two customers are alike, and every cooling operation has different requirements. Dow’s Expert Centers are there to help. With an advanced array of technologies to address specific cooling water issues, Dow works with your service provider to deliver solutions that help prevent problems, protect assets, and improve efficiencies throughout the cooling water process. Cooling water systems need to replace water loss from drift, evaporation and blowdown. Depending on region, water source and cooling tower type, a variety of technologies may be required to treat makeup water before it enters the cooling tower system. Dow can work with your service provider to help you reduce corrosion, scale, biofouling and other make-up water problems, with technologies that include microbial control, antiscalants, particle filtration, ultrafiltration, reverse osmosis and nanofiltration. Cooling tower systems operate under closed or open conditions, with each system facing issues due to changes in water quality, process leaks, heat loads etc. These variables present major challenges in maintaining consistent system performance. Dow can help you reduce corrosion, scale and biofouling, despite changing system conditions. Working with your service provider, we can provide the optimal mix of technologies, including microbial control and antiscalants. Because cooling tower blowdown is too dirty to be reused without treatment, it is typically sent directly to the plant’s wastewater treatment plant. This imposes a hydraulic load on the wastewater treatment system. More importantly, a tremendous amount of relatively clean water is wasted, adding significant cost and compliance complexity. Dow experts work with your service provider to deliver the optimal solution for your needs, using robust, reliable, fouling-resistant, filtration and purification technologies to recover and return up to 90% of blowdown water for makeup.